My love affair with Japanese food is only reasonably new, but now that I’m a fan I really can’t get enough. 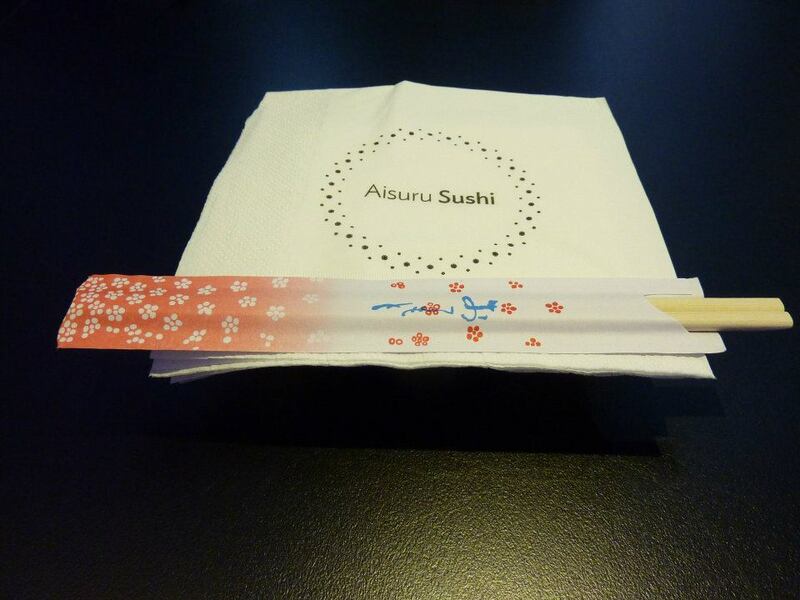 I’ve heard that there was a new Japanese restaurant in Northbridge called Aisuru Sushi and a girl from work had been and given it a rave review so I was really keen to go. So I tried to line up a dinner outting with M&M. It took some initial shuffling around because I knew that if we wanted to head to Aisuru we would need to be the early because they don’t take bookings. So the stars aligned and we could all make it along on a Tuesday night at 6. A bonus of Aisuru is that it’s BYO and an added bonus is that Grape Skin Wine Bar is just across the road they sell many a delightful bottle of wine. I had arrived first so I went and picked up a few bottles of white and waited patiently for doors to open at 6pm. It’s not a huge place, but you have your choice of either sitting along a bar, right up against where they make the sushi or there were tables either along the front or back wall and a few outside too! We were seated near the back. I had liked the thought of being so close to the sushi action, but because there were four of us, I thought for conversation it was easier if we went for a table option. We were given menus and brought wine glasses (corkage is $2.00 per person – very reasonable). The menus were fairly overwhelming so we were very grateful when the manager come across and asked if he could assist. There is an abundance of sushi options on the menu so the manager started by letting us know that the most popular items currently were. He was an incredibly friendly fellow and it felt very welcoming that he spent the time with us to ensure we were all comfortable with what to order. We decided that the manager was the fellow in the know, so we essentially structured our order on his recommendation.s For our starters we ordered 4 things…..
Sweet Corn Tempura ($9.50) Fresh sweet corn off the cob that is fried in tempura batter, then lightly salted and drizzled with truffle oil and aioli, and sprinkled with spicy shichimi togarashi flakes – loved it! 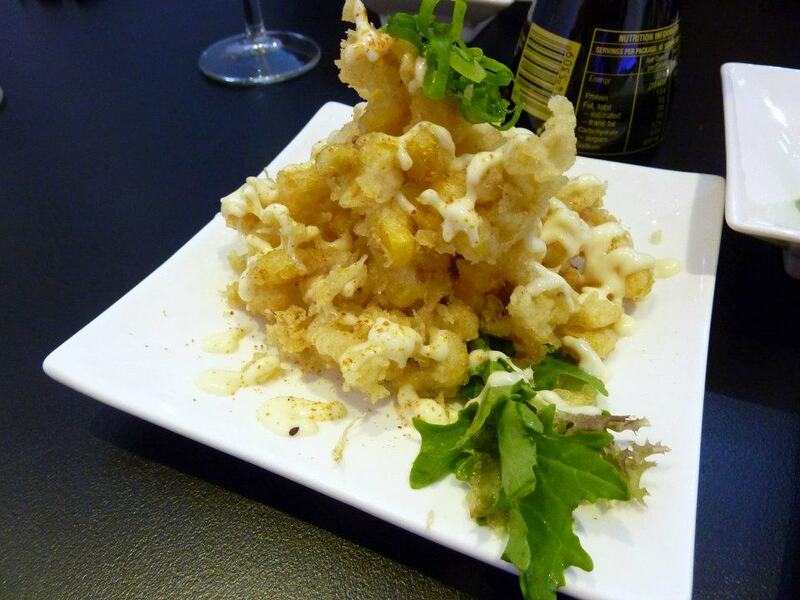 I’ve always had a lot of time for corn and in its crunchy tempura batter it was just a great intro dish! GG fell in love with soft shell crab when we had it at Ku De Ta in Bali in November last year so we couldn’t go past the Soft Shell Crab Salad on the menu and it was wonderful with its crunchy greens and the beautiful crispy crab. 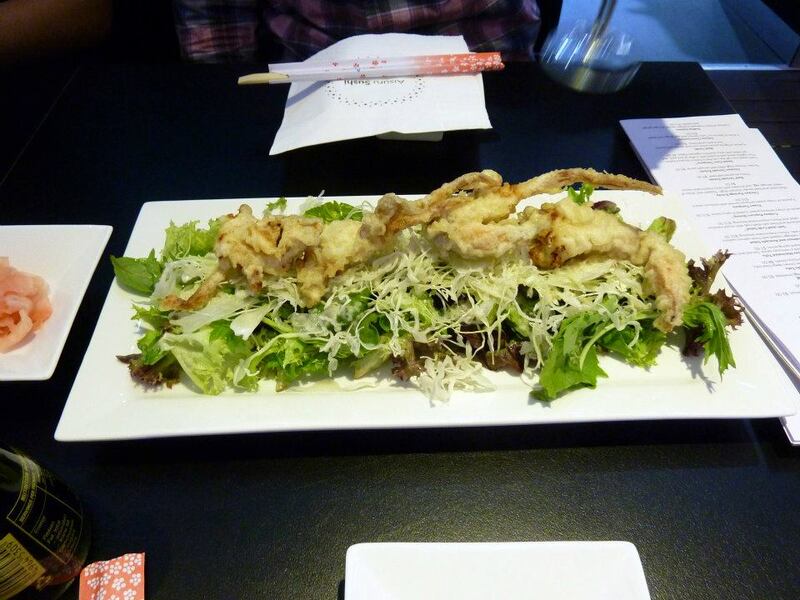 Soft-shell Crab Salad ($15.50) Lightly battered and fried soft-shell crab with mixed mesclun salad and Aisuru mayonnaise dressing. And sticking with seafood we ordered a serve of Creamy Popcorn Shrimp ($15.50) 5 pieces of crispy tempura prawn coated in spicy sauce. I’m not sure calling them shrimp is fair because they were a big meaty size and they had such a beautiful creamy sauce on top. Another winner! Our final starter was one of the very indulgent Japanese Hokkaido scallops ($11.50 for 2) – served raw with a colourful smattering of orange fish eggs, i’ll admit I was a little nervous. 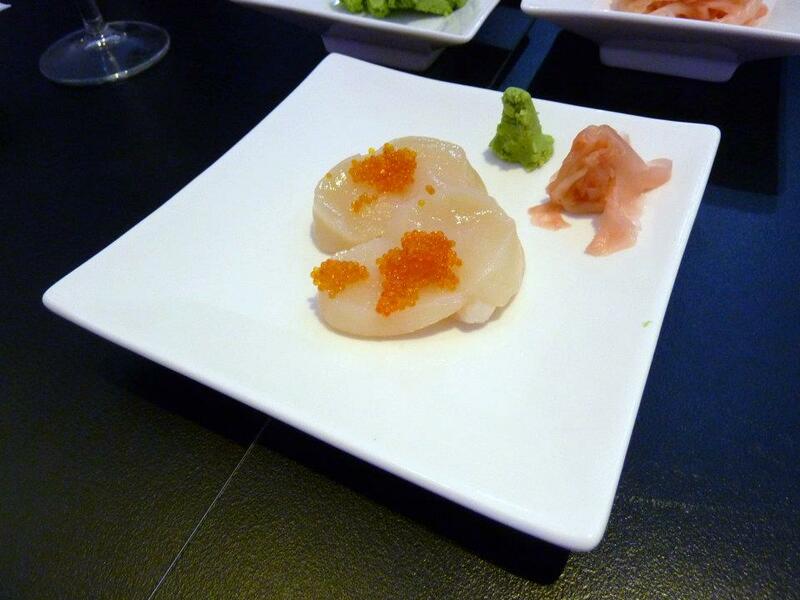 I am a big scallop fan but have never had them raw. I waited to GG to eat his and asked if they had a strong fishy flavour. I was assured they did not so I took a bite. Just divine. Not a trace of fishiness, but instead a sweetness, well known with scallops. 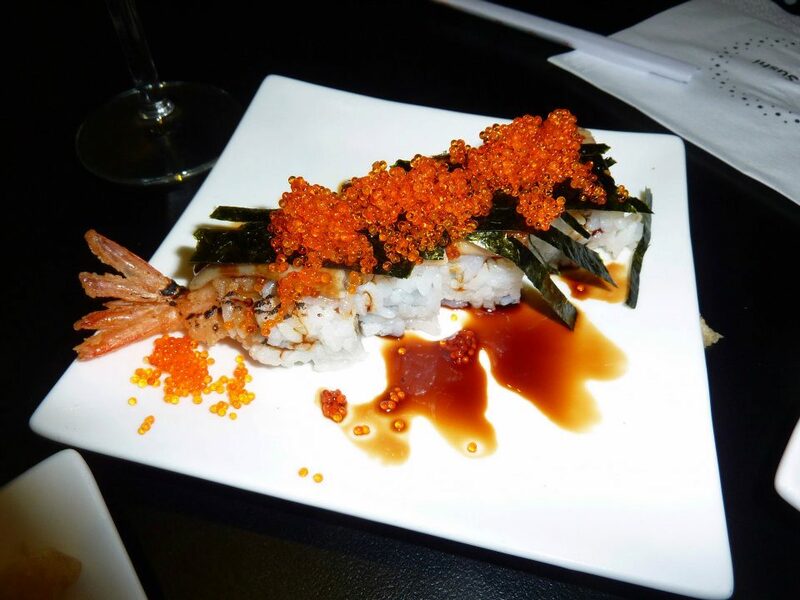 So we’d tried these four fabulous dishes and still had yet to try any of the signature sushi. The way their menu works you can either order a serve with 4 pieces of 8. 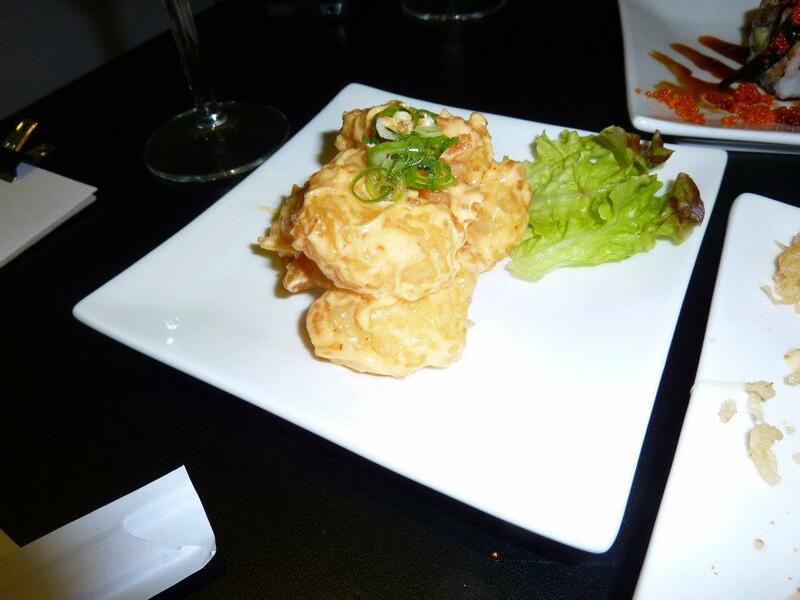 We thought that we would be better served by ordering the 4 piece serves, mainly so we could try more different kinds. We started by ordering 6 types…. starting with the Plum Flower Roll ($9.00) Chicken teriyaki and avocado wrapped in nori and shari. Wrapped again in tamago egg wrap, and drizzled with special plum sauce. Really enjoyed this one. The plum sauce added a subtle sweetness and hard to go wrong with anything chicken teriyaki. Black Velvet Roll ($12.00) Tempura prawn, seared tuna, cucumbed, crab stick and spring onion, wrapped in nori and shari. 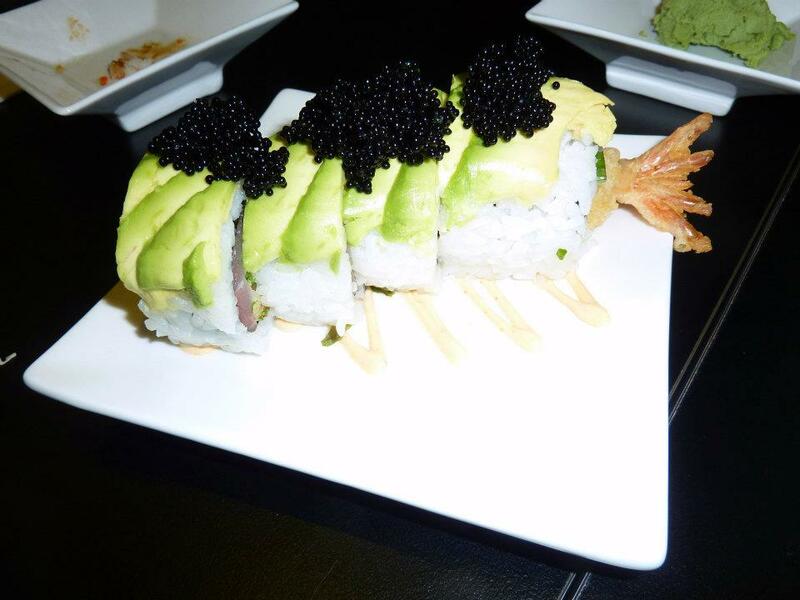 Topped with avocado and black cavier. Drizzled with chilli mayonnaise. The crunchy prawn, the creamy avocado, loved it all! Dynamite Roll ($10.00) Finely sliced sashimi tuna mixed with spicy sauce and wrapped in nori and shari. Topped with more hot sauce and torched. The sashimi tuna melted in my mouth and then there was the added plus of the spicy sauce. It was a pleasant contrast and wasn’t it just a vision with all its flashy colour! 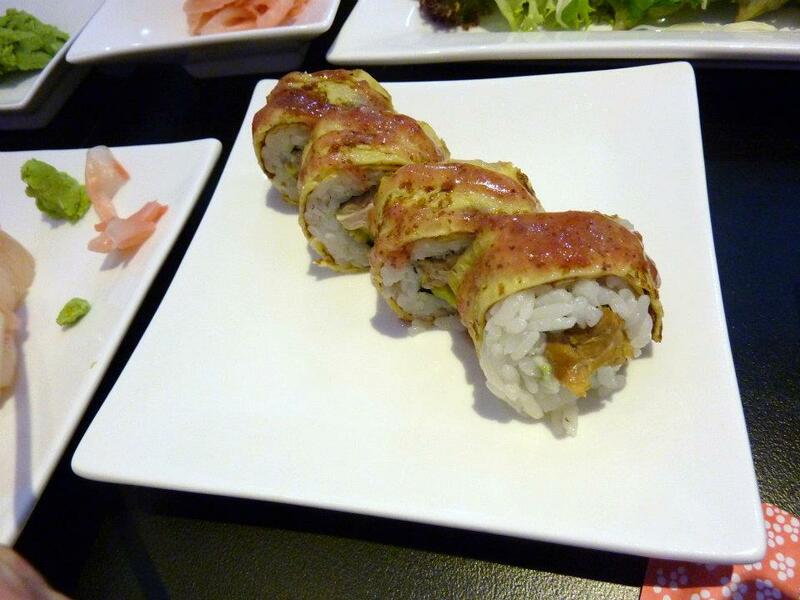 Spider Roll ($11.00) Fried soft shell crab, cucumber and lettuce, wrapped in nori and shari. 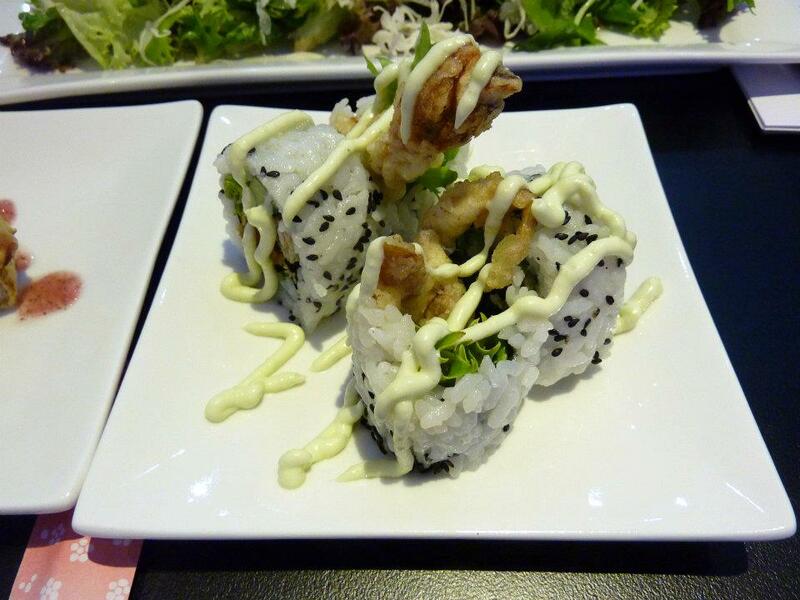 Topped with black sesame seeds and drizzled with wasabi mayonnaise. Another course with soft shell crab so I knew GG would be loving it! Trickier to eat but very tasty! Dragon Roll ($11.00) Tempura Prawn and cucumber wrapped in nori and shari. Topped with unagi eel, nori flakes and drizzled with eel sauce. Here I was thinking that I wouldn’t enjoy this course because the thought of eel sauce sort of weirdest me out, but it wasn’t bad at all! And again – the colour – that fiery splash of orange fish eggs! Crunchy Budda’s Delight Roll ($8.00) Avocado and lettuce wrapped in nori and shari. 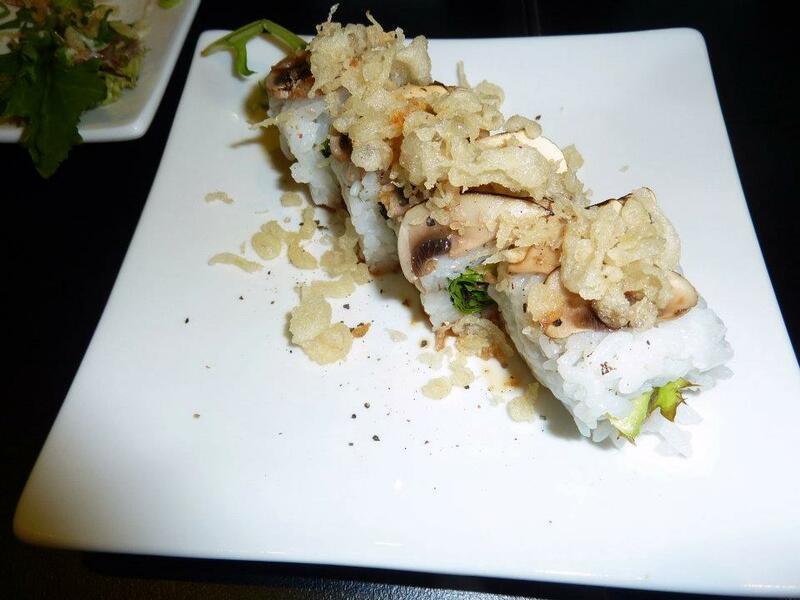 Topped with season sliced button mushroom and torched. Topped with some tempura flakes and teiyaki sauce. 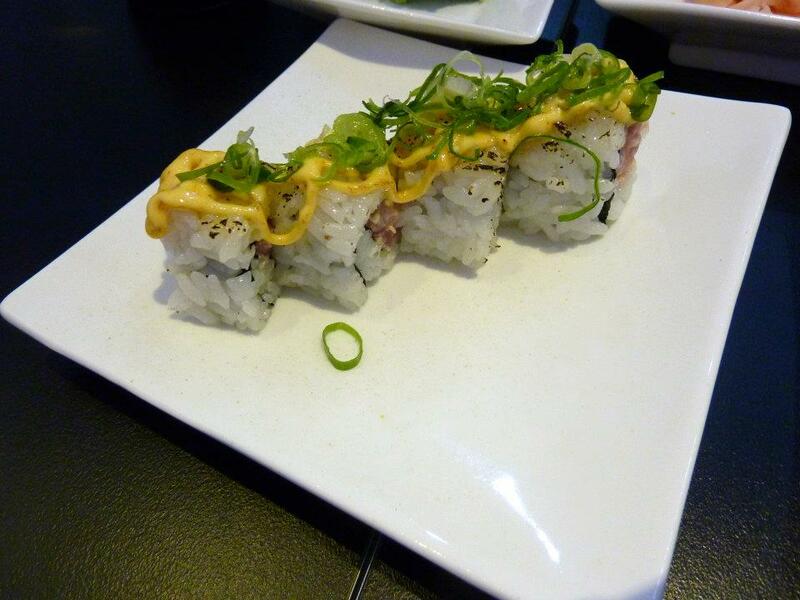 At Aisuru they have tried to cater for the vegetarian crowd and have an impressive vegetarian sushi menu. So we thought we would try the mushroom option and wowsers it is delicious!! There was also a beetroot sushi which we didn’t have on this visit…. but i’ll be back…. i’ll be back! So we’d tried these first 6 and had a little room left and gave the floor to Mr Manager. His choices were definitely on the more challenging side…. or their bolder sushi options. 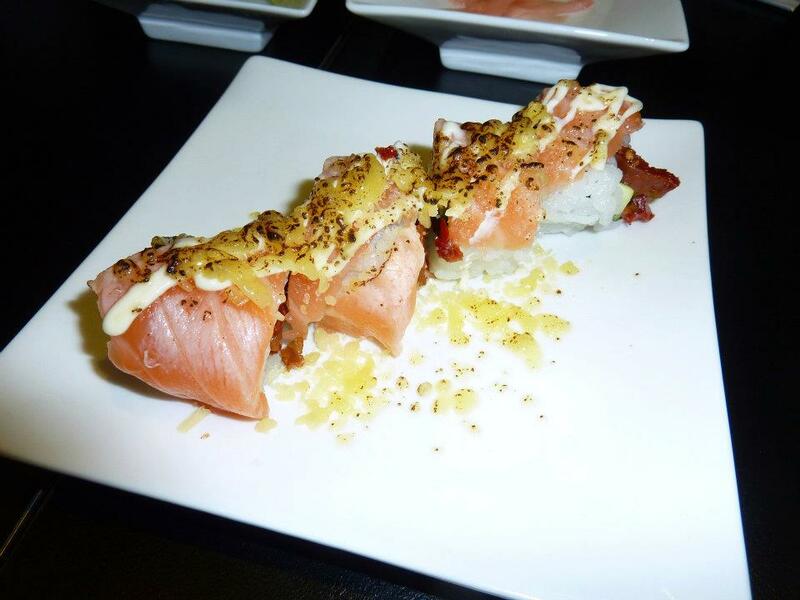 First we tried Grilled Salmon Roll ($10.00) Sundried tomato and cucumbed wrapped in nori and shairi topped with salmon and grated cheddar cheese and then torched. Drizzled with Japanese mayonnaise. I’m not the biggest sundried tomato fan so I was going to be a hard sell, but I applauded the boldness of sundired tomato and also cheese in a sushi roll – definitely different! Now at this point I was nearly in a sushi coma so I forgot to take picks of the two next ones we sampled – Masaba ($10.00) Cucumber and crab stikc warpped in nori and special shari, mix of ginger, spring onion and balack seasome seeds. Topped with pickled mackerel and then torched. Served with wasabi mayonnaise and Torch Roll ($11.00) Tempura prawn, avocado and crab stick, wrapped in nori and shari. Topped with tuna and pickled macarel. Drizzled with spicy sauce and torched. Topped with fish eggs and spring onion. Now I’ll put it out there that neither of these were my favourites because pickled mackerel is such a strong flavoured fish but again – interesting combinations for those fishy fish fans. It was hard to pick a favourite out of the 9 combinations we had had but I think Plum Flower Roll gets my vote because it was so well balanced with just a little sweetness. Lovely lovely! Now we had eaten a lot at this point – a lot! – but there was always room for dessert and there were two dessert options in the Aisuru menu that had our name on them! So we ordered two of each. 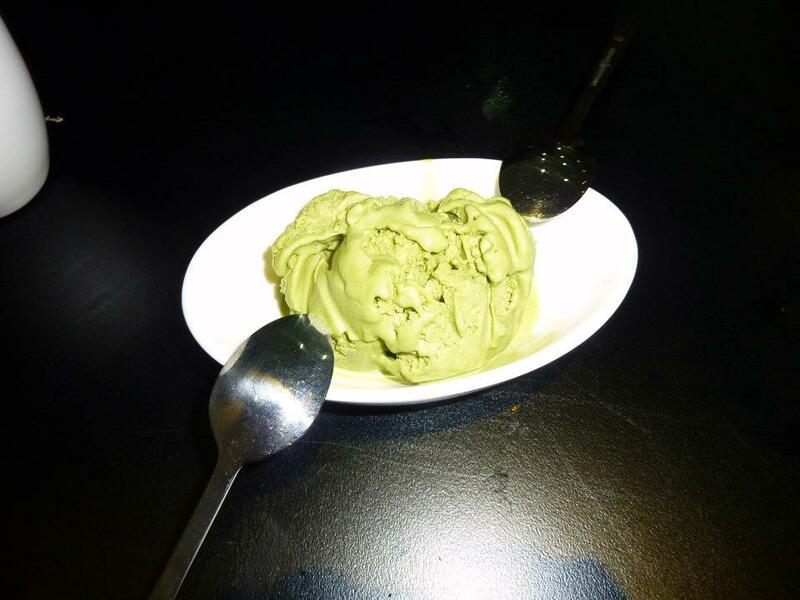 First up was the Green Tea Ice Cream ($5.00) Hand-made matcha green tea. Creamy and smooth in texture, with a strong matcha flavour. The green tea flavour was incredibly intense but the creaminess of it was just divine! Something different for someone who was already on team ice cream. 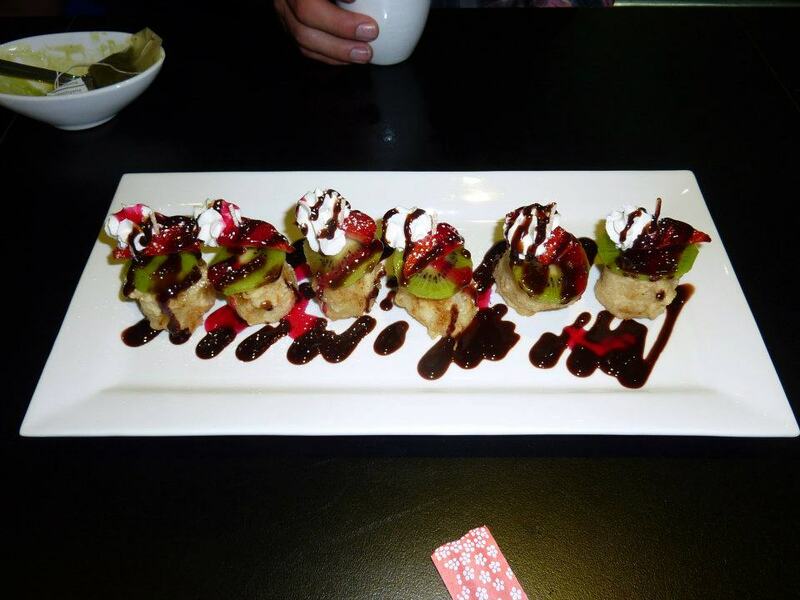 Our next dessert option was Banana Maki ($12.00) 6 piece of fried banana. Topped with fresh fruits and whipped cream. Sprinkled with icing sugar and drizzled with chocolate and raspberry sauce. I think my only drama with this course was that the pieces of bananas were on the larger size and I couldn’t eat them in one bite, but is that really a fault with this dish? Hardly! It was a wonderful dessert with its fruity, creamy deliciousness! Prev Red Cabbage – Revisited…. for GG’s Birthday!